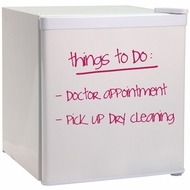 This 1.7 cubic foot Write Fridge is perfect for dorm rooms offices or supplementary refrigerators for your home. This fridge is both fun and functional. You can write notes lists and scribble directly on the surface and then wipe it clean. It was featured in "Food Now " an online newsletter distributed by "Cooking Pleasures Magazine." It accommodates tall bottles and cans and is loaded with shelves and storage areas.